The top of the line PUMA boot gets three new incarnations: 3 new v1.10s with a style all their own! Anelka, Samuel Eto'o and Peter Crouch all lace into PUMA's v1.10, a dizzying combination of speed and style. This kangaroo version - weighing only 8.2 ounces - adds unparalleled comfort to the equation. The upper features soft, extremely comfortable kangaroo leather with grip texture and a lace cover, TPU injected external heel counter that offers heel stability and support; and the "Kinte" pattern: inspired by African soccer and pays tribute to 2010. The sole includes lightweight Pebax frame that is transparent in mid-foot and heel; with carbon fiber composite embedded in the forefoot, and pointed stud configuration that ensures smooth ground penetration, optimal traction and stability. 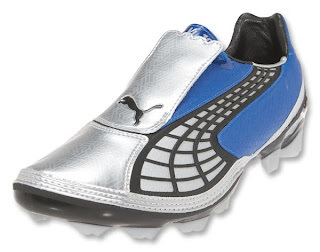 PUMA v1.10 i Soccer Boots in PUMA Royal/PUMA Silver/Black. Experience the rush of raw, primal speed with the PUMA v1.10, offering a lightweight microfiber and textile upper with a softer toe area for a better touch on the ball. It also has a dirt and water repellent coating. (You'll love it's sick look and the feel of the ball off your foot. )PUMA's new lace cover offers up clean kicking and larger ball contact area, while an air mesh insert on the tongues lets your feet breathe. Extremely lightweight Carbon Fiber in the forefoot distributes pressure and creates flexibility. Translation - this boot is made to fly down the field. The mid-foot is reinforced with TPU, which prevents midfoot bending and further enhances stability. A TPU injected external heel counter offers heel support. The lightweight Pebax sole is transparent in the midfoot and heel for eye-catching style.Pointed stud design ensures easy ground penetration for optimal traction, maneuverability and stability. All of these elements add up to 8.2 ounces of speed. 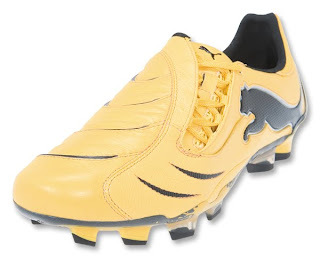 PUMA PWR-C 1.10 Soccer Boots (Teamsport Yellow/Black/Chrome). 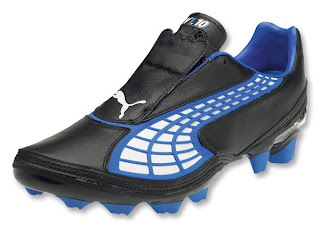 Have a blast with the power-enhancing PUMA PWR-C 1.10. This super fast cat includes kangaroo leather upper with SpringTech foam for explosive shooting. The material mix on the upper - using a combination of soft thin kangaroo leather in the vamp with synthetic microfiber around the heel area - keeps weight down to boost control and touch. PowerGil Technology enhances kicking power by putting extra power behind the ball as it is released. TPU-injected external heel counter for stability.INSOLE: EVA insole for comfort. And, the sole is lightweight TPU-injected pointed stud configuration. PUMA is the sign of quality and also the sign of greatness.